Oregon Wine and Beer Tasting in Style! For my husband and I, the best part of our PCS move to Monterey was the city’s proximity to so many different types of cities and towns. Living on the East Coast most of my life, I never really considered visiting Oregon but our duty station at NPS allowed us to make the trip for less money and less travel time. The city of Portland and its southerly neighbor, the Willamette Valley, were regions previously unknown to us, so we took the chance to investigate the area’s beer and wine scene. We were so pleased to learn how interesting the beer and wine making processes could be. The beer knowledge in our family is handled by my husband, and I happily deal with the wine selection. 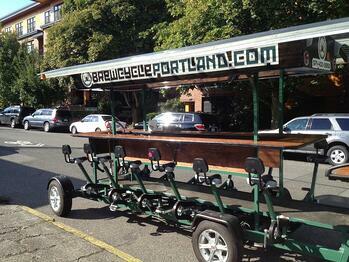 However, we both would really recommend a ride on Portland’s BrewCycle. It is a rather a genius way to lead a group of beer tasters to the city’s best brew pubs. Each cycle is captioned by a BrewCycle driver who is privy to all of the details at each beer stop. The company works with the local brewhouses to provide customers with a learning experience about the process and the tastes it produces. Oh, by the way, you get to burn calories while pedaling through the streets. We had a great time and it really wasn't taxing to pedal around. Pedaling was also a very interesting way to bond with your neighbors and learn their personal stories. BrewCycle rotates the breweries they visit, so research in advance where you might park your bike as to not be disappointed. Although less exertion went into our wine tasting, Backroad Wine Tours made the tour just as memorable. The whole experience was very relaxing. Our guide Jeffery was extremely knowledgeable, sincere, and generally seemed pleased to be driving our tour that day. After a quick pick up from The Allison Inn, he whisked us off in a comfy, clean minivan with our two tour partners to start our boutique vineyard tour. Our first stop was to magnificent Soter Vineyards. The tasting room views here were indescribable! Backroads has strong relationships with winery and vineyard owners which allows tour groups unique tasting experiences in breathtaking settings. The views from hilltop tasting rooms were by far some of the best moments of the day. Expect tasting fees to be between $10.00 and $15.00 per person, however many of the rooms we visited waived those fees if you bought a bottle. After finding out my husband was in the Army, one pourer waived our fees all together. Our full day Oregon tasting adventure was broken up by a bistro style lunch which creatively reflected the food harvested from farmland in the area. After sampling more wine than we imagined and listening to the vintner’s stories, we were brought back to our inn and were genuinely sad to say our goodbyes to Jeffery and our tour mates.